Today the first ugly shoe dropped on THE Ohio State University football program. But before I go any further, some perspective. Ohio (and the rest of the mid-west) is the cradle of football. It was born here and its Valhalla is here (hall of fame). Ohio State University is one of the cornerstones of the sport. 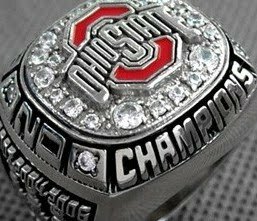 Looking at the big picture; OSU (and that "school up north") are bigger then the Big Ten, the division of which the are in. Not only in tradition, but in economy and just shear size. OSU is the largest institution of higher learning on the planet. If that doesn't get your attention, I'm not sure what will. The reason I mention a bit of perspective first is because of the ridiculous amount of spin going on around the current situation they find themselves in. A situation of the very serious kind. Six total players have been suspended for games starting next year. Five players for five games and another for four. All are significant. Terrell Pryor and Daniel Herron. Starting receiver DeVier Posey, All-Big Ten offensive tackle Mike Adams and backup defensive end Solomon Thomas. Ohio State fans will remember these names for decades to come. The infractions they committed are selling personal items. Things like 2008 Big Ten Championship rings, jerseys, "gold pants" they get for beating Michigan. Even getting free tats for autographs was mentioned. For old timers this is a crime in the highest order. For the rest of the country it is just another bunch of entitled kids taking advantage of their situation. For the press? Just another story to keep College Football king and a chance to take swipes at the NCAA. The NCAA. The rule makers. Now, I live in Columbus. I know that all major programs push the limits of the rules. Hummers, nice apartments and the like. It goes on in most top tier programs. But for the NCAA to take action on a school like OSU? You have to be doing something really - really wrong. Right now Mr. Smith is throwing the University on the sword stating that it was that they didn't inform the players enough. Coach Tressel, wearing a black suit, stating the "we as coaches, fell short". Never underestimate what a man wears to a extremely stressful situation such as this. Never. Anyway, the press is out in full. Claiming that players should be paid and blah blah blah. I can't stand it. Fact is, they broke the rules they had to follow. I have to follow the speed limit on the way home. Why does the press feel that players don't have to follow the rules that they sign up for? Mark my words... Another shoe has yet to fall and it will be ugly. This school's reputation has taken a major hit. I'm not that old, but old enough to know that when this happens... you are done for years. Even decades. So how is this my fault? I may have just upset the football gods by reaching out to a nice lady up in Ann Arbor yesterday. My bad. And my bad for saying my bad.